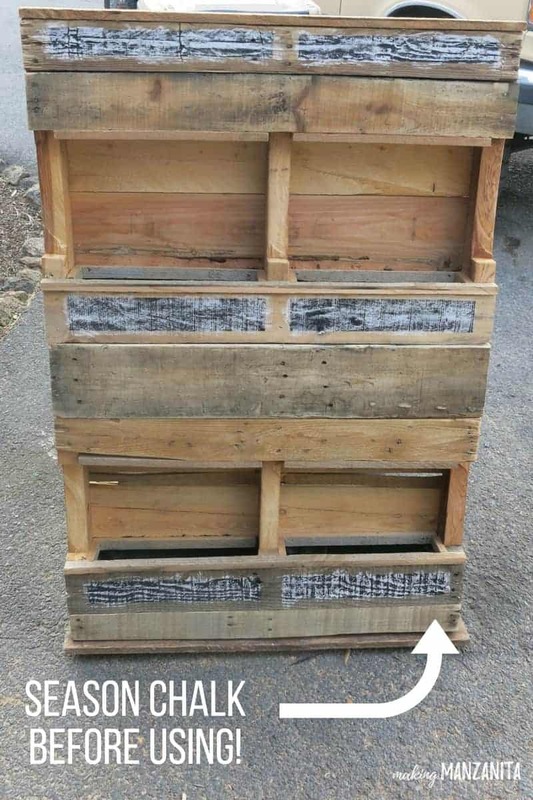 Today I’m going to show you how to make a vertical garden with a pallet. This DIY renter friendly garden is FOR YOU, my friends. 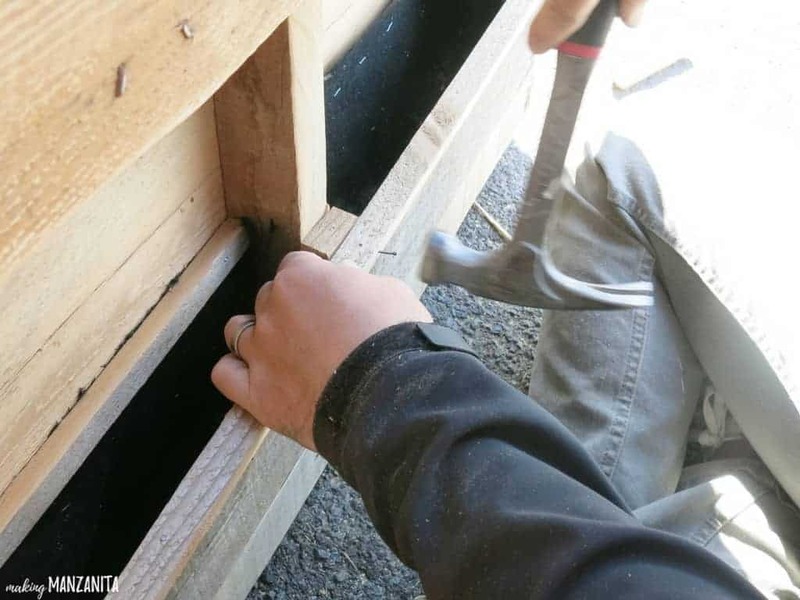 Earlier this week I shared how we built raised garden beds in our backyard. I love how tall they are so I don’t have to bend over when I’m working on the garden. But here’s the deal….we’ve got a large backyard and could easily spare the space for three large raised garden beds. I realize that not everyone has this much space to garden. Some of you are also renting a house or apartment and don’t have the flexibility to install something like a raised garden bed. This vertical garden can be placed on the balcony of apartment. 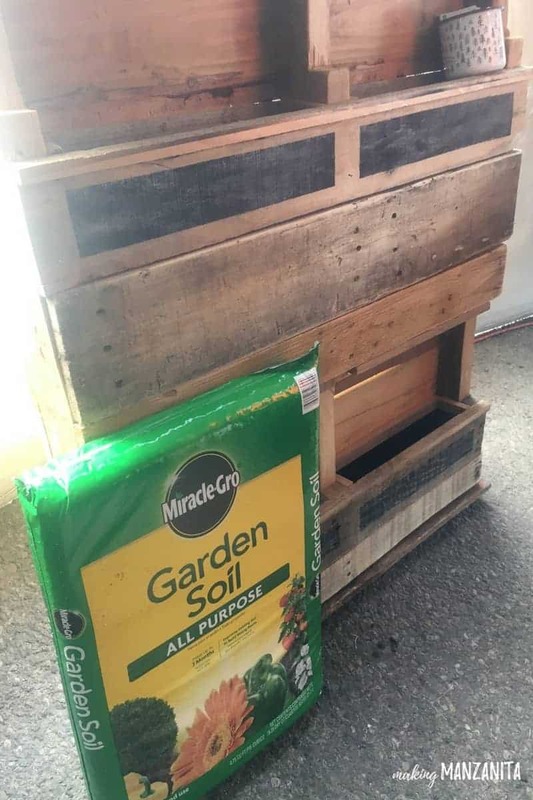 The pallet garden can also be picked up and moved when you change rentals. It’s the perfect small backyard garden and could even be used indoors if you’re careful about not over watering. I must first apologize for not having many “after” pictures of this project. 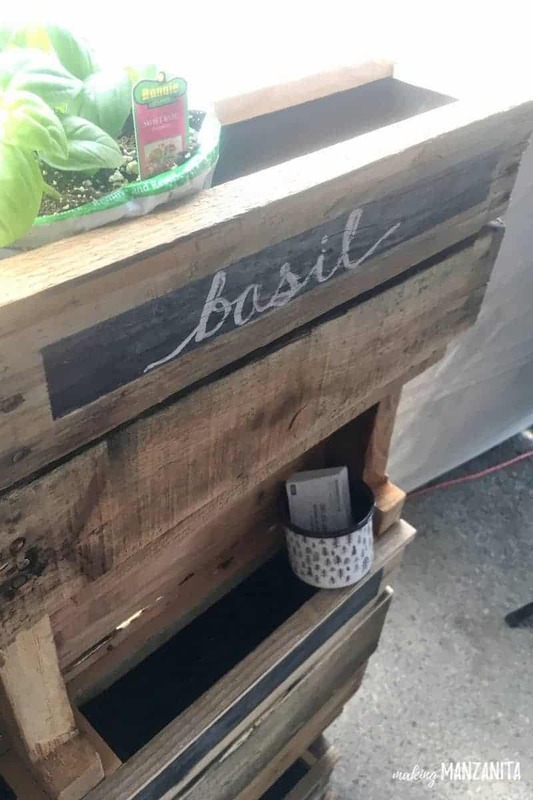 We actually made this vertical garden with a pallet for a local furniture flip contest and charity event for Habitat for Humanity. It was auctioned off at the event. Someone else is enjoying this now and we were able to raise a bit of money for a great cause while we were at it. The “after” photos I do have in this post are from the auction event and the lighting is not great. Thanks for bearing with me. 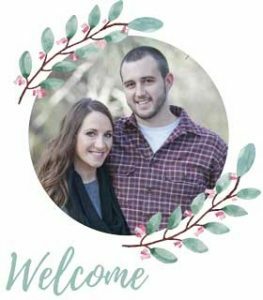 I considered not posting about this because I didn’t have great pictures, but I just couldn’t hold back sharing it with you! This vertical garden with a pallet post contains affiliate links, but nothing that I wouldn’t wholeheartedly recommend anyway! Read my full disclosure here. 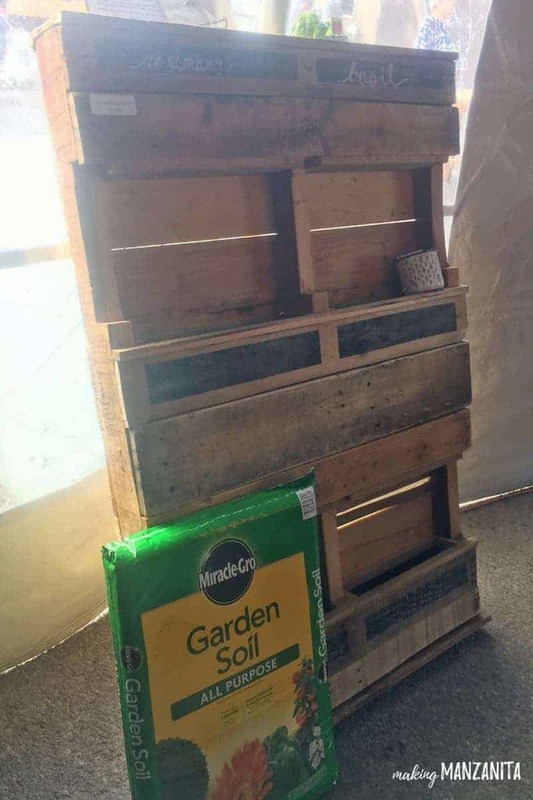 Pallets come in all shapes and sizes, so your vertical garden with a pallet may turn out a little different than ours. The pallet we used was a rather tall pallet that had a full back paneling of wood and three wood slats on the front. We decided to keep those three wood slats on the front and just add an extra slat (or two) of wood to them to make the pockets for garden deeper. The wood slats we added were from another pallet we had on hand that was the same width. We also added bottom pieces to the bottom of the planter boxes. This helps hold the planter in place when it is full of soil and plants. Step 2. Give the pallet a light sanding. Once we got all of the pallets boards added, we gave everything a light sanding with a hand sander and 100 grit sandpaper. This isn’t necessary, but some pallet wood can be pretty rough so this just helped smooth everything out. Step 3. Cut landscape fabric. 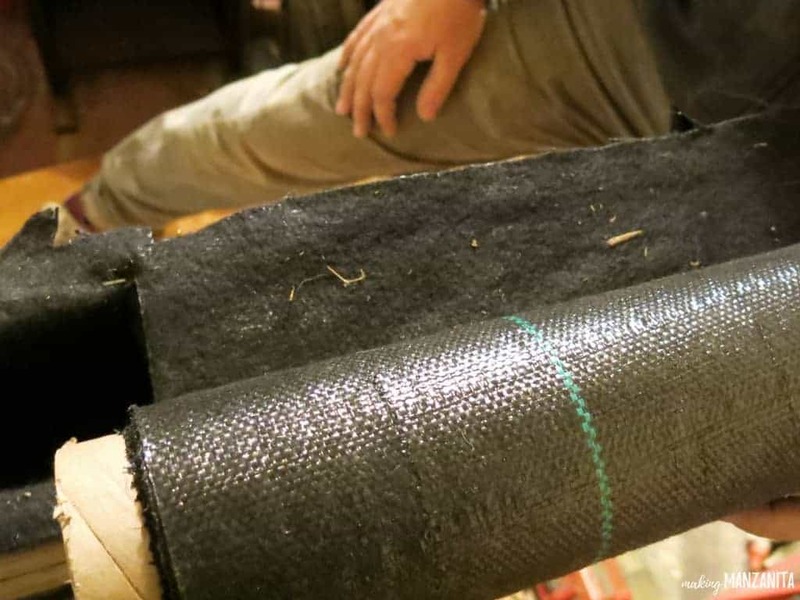 We were using just the end of a very large roll of landscape fabric, so we decided to just cut the whole roll right down the middle using a hack saw to get the desired width we were looking for. This saved us a lot of time rather than cutting each individual piece. Step 4. 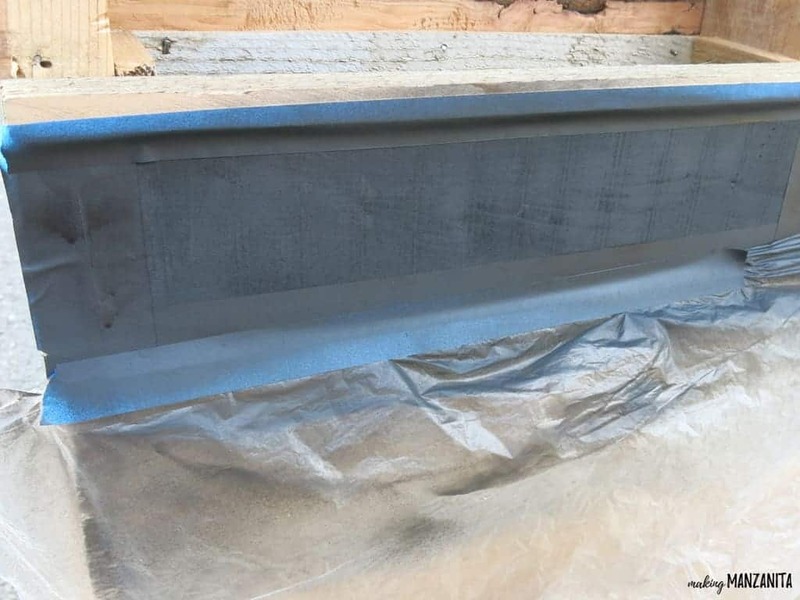 Attach landscape fabric. 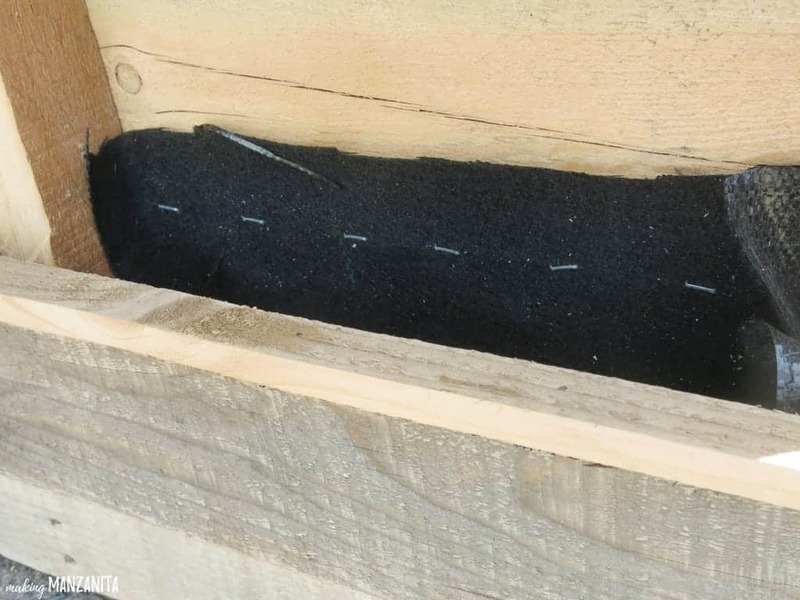 Once the width of the landscape fabric was cut, we started attaching the landscape fabric to the inside of the boxes we’d created in the pallet. 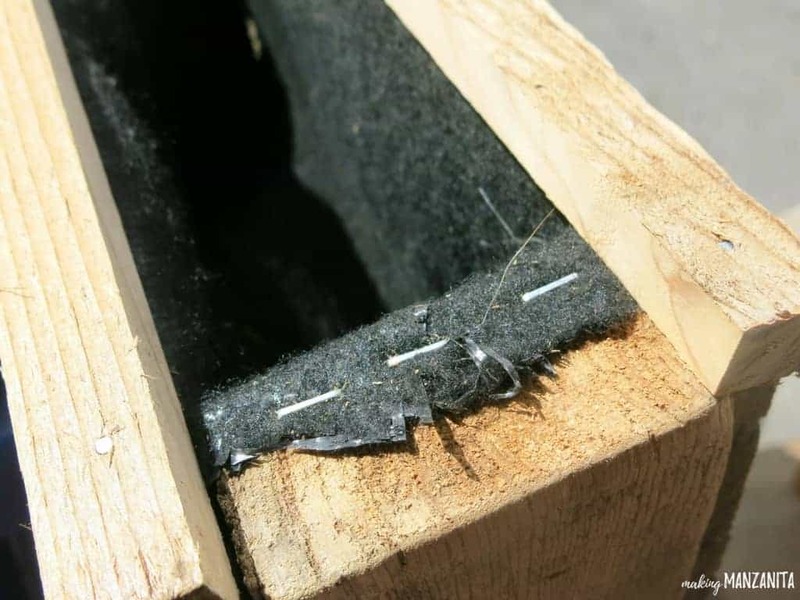 We started by doing a line of staples with a staple gun on the back panel, then draped the fabric down into the box and up the inside of the front panel. 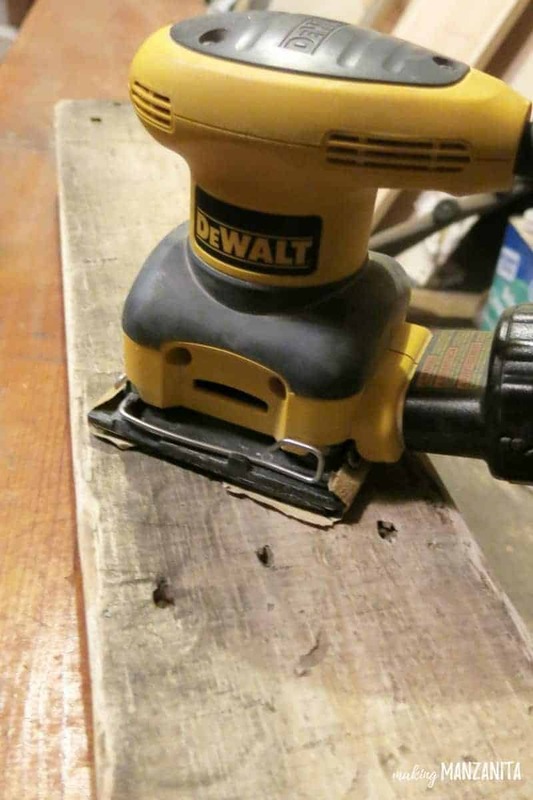 We did another row of staples on the top of the front piece of wood. Then we added a few staples on the sides to hold the excess fabric in place. Step 5. Add trim pieces. To finish things off and make it look a little more professional, we cut down some narrow pieces of pallet wood and added them on as trim to cover up the staples. This was purely cosmetic and not necessary, but I loved the way it looked. Step 6. Chalkboard paint front. I started by taping off the sections that I wanted to paint with the chalkboard paint. I decided to do a rectangle under each planter box to write in the type of plant. Next I used spray chalkboard paint on the sections. I added in some plastic so that I didn’t get the spray paint elsewhere on my vertical garden with a pallet. I did about 5-6 coats of spray chalkboard paint. Step 7. 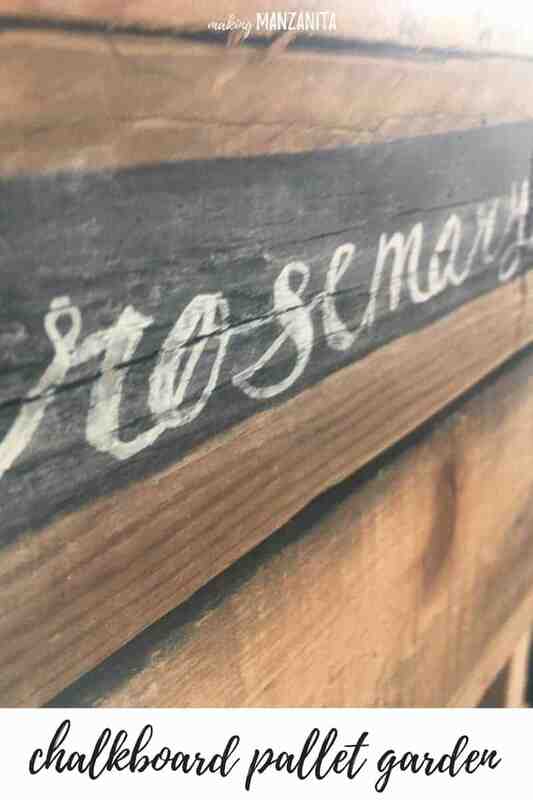 Season chalk paint. 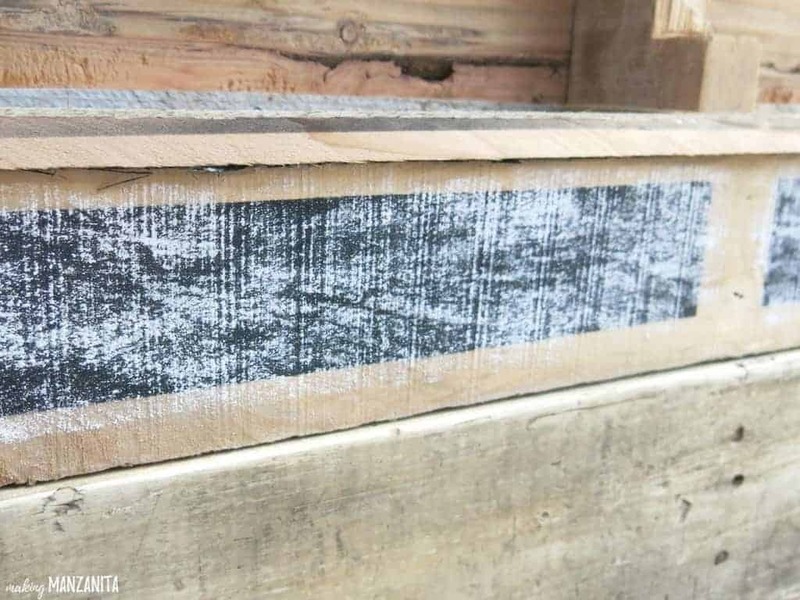 If you’re planning on using chalkboard paint, it is very important to “season” it before using. This is really simple. You just run the edge of a piece of chalk all over the paint and then erase. Step 8. Plant herbs & enjoy your renter friendly garden. I’d recommend adding some sand, small gravel or Perlite to the bottom of the landscape fabric pockets before adding the garden soil and plants to give yourself a good base for drainage. Since you have a very small space in your vertical garden with a pallet, it’s best to plants herbs, dwarf or bush versions of veggies and herbs, or compact fruits and veggies. Think strawberries, bell peppers, salad greens and herbs. Keep peppers, beans & tomatoes on top shelf only so they can grow taller. 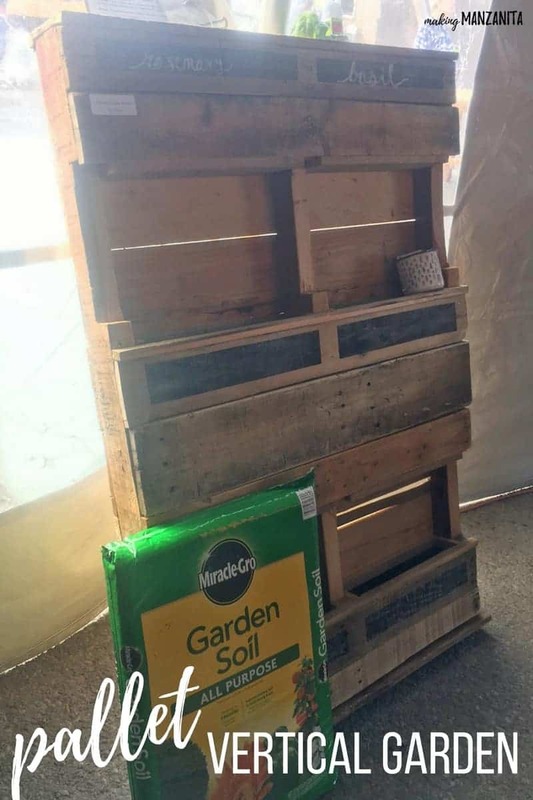 See how simple that was to turn a pallet into a garden!? If you’re interested in dipping your feet into the gardening world, a small vertical garden with a pallet is a great starter garden. Don’t let renting stop you from gardening. This renter-friendly garden can move with you. What will you plant first?! 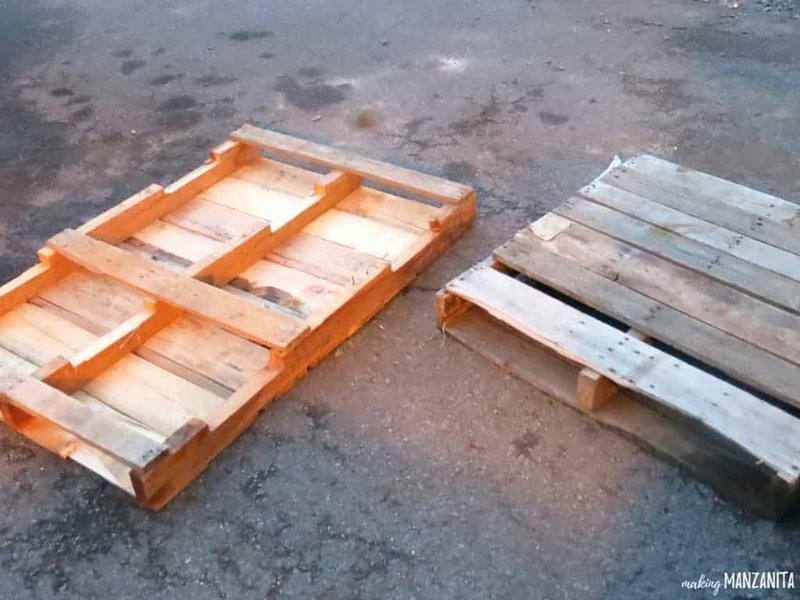 Looking for some other ways to use pallets in your garden? 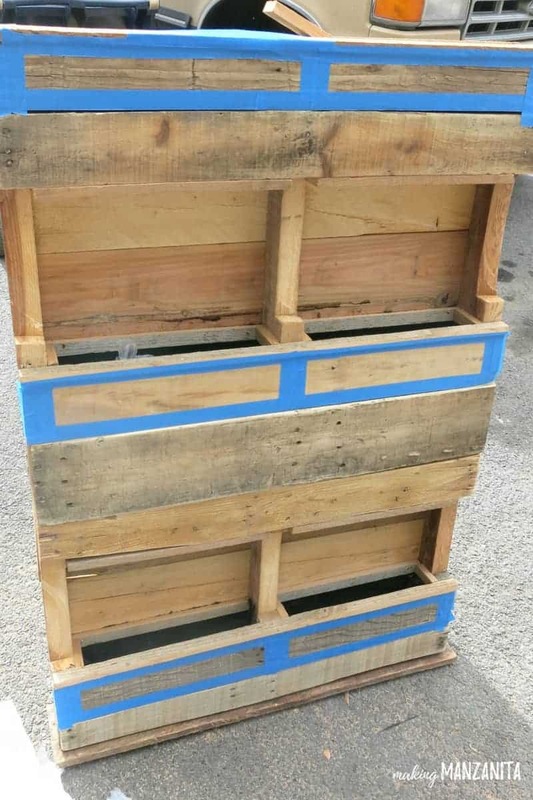 Look at this awesome Strawberry planter box made with pallets by Lovely Greens. Make a trellis from pallets like this one from One Hundred Dollars a Month for climbing plants, like pumpkins. Check out this pallet gardening table from Jenna Burger Design that folds down from the wall!